Aids charities have reacted angrily to Australian Prime Minister John Howard's opposition to HIV-positive immigrants moving to Australia. 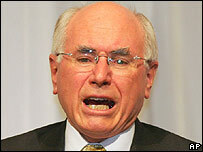 Mr Howard proposed a blanket ban, which would only be exempt in special cases, during a radio interview in Melbourne. Australian HIV activists said the country's immigration laws already had tight restrictions. 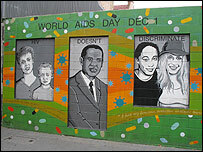 The UK's National Aids Trust described the proposal as illegal, discriminatory and ineffective. Mr Howard was asked about the issue during a visit to Melbourne, in Victoria state, which has seen a sharp rise in HIV cases. Infectious diseases specialist Dr Chris Lemoh called it "a hysterical overreaction, it mixes racism with a phobia about infectious disease", according to the Associated Press news agency. "To not allow people to come on the basis of any health condition is immoral, it's unethical and it's impractical to enforce." Yusef Azard, from the National Aids Trust, said tighter controls on immigration would not necessarily have an effect on the rate of infection. "The United States has had these sorts of strict entry restrictions on HIV for many, many years," he said. "It's got the highest rate of HIV in the developed world. So it doesn't actually do any good. People go underground. Stigma and discrimination increases in the country and makes the response to HIV all the more difficult." The BBC's Jill McGivering says the National Aids Trust monitored policy in almost 170 countries and found that most had some sort of HIV restriction on non-nationals. She says they can range from blanket bans to refusal in certain categories, such as residency or right to work. Five years ago, Canada tightened its restrictions. Now foreigners applying for residency are tested and likely to be refused if they are positive. Visitors to mainland China are refused entry if they declare themselves HIV positive on immigration health forms. Foreigners who stay for more than six months have to show evidence of a negative HIV test, our correspondent says. "I think we should have the most stringent possible conditions in relation to that nationwide, and I know the health minister is concerned about that and is examining ways of tightening things up," Mr Howard said.